Dr Emma Gloury has returned to work after maternity leave. The days and times that Emma will be available for appointments currently change from week to week. For availabilities, please call the clinic on (03) 9587 6798 or Book Online. Dr Emma Gloury (nee Pittorino) is a passionate and dedicated Osteopath who provides quality osteopathic treatments. Emma completed her Bachelor of Applied Science (Complementary Medicine) and Masters Degree (Osteopathy) at RMIT University. She is a caring and compassionate person that shows genuine concern for the health and well-being of her patients. She enjoys treating people of all ages. Emma also prepares additional and specific home based programs for her patients to assist in recovery from their injury and prevent re-aggravation. Emma is particularly passionate about helping people deal with hip pain. Emma is highly skilled in treating other areas including neck and shoulder pain, treating headaches and migraines, and lower back pain. She has experience treating office workers, trades people, elite athletes and weekend warriors. Emma worked for a number of years as a sports trainer for an AFL football team competing in the Victorian Amateur Football Association (VAFA) and regularly treats athletes including Triathletes, Swimmers, AFL football players and long distance runners to name a few. Please call (03) 9587 6798 if you would like to make an appointment to see Emma. 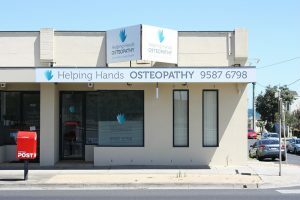 You can also Book Online via our website or the Helping Hands Osteopathy Facebook page.